We’ve had a scan through this morning’s papers. 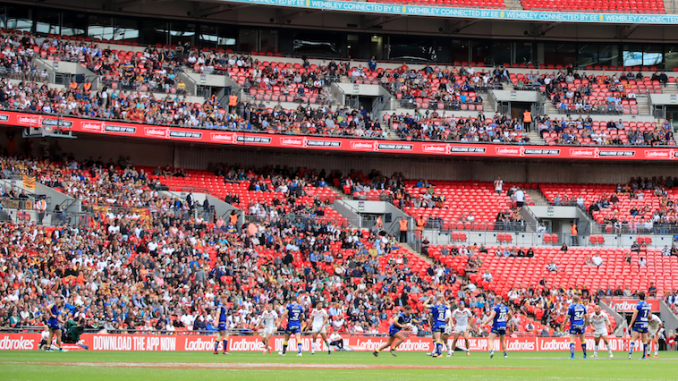 The Rugby Football League has explained why they have been forced to stage the 1895 Cup final after the Challenge Cup final, report League Express. The Rugby Football League has refused to sanction reserve grade games for clubs without a team in their competition, report League Express. Instead, clubs are being told to send their players out to clubs on dual-registration who do run reserve grade teams in order to get players game time. League Express have revealed the governing body have denied Dewsbury Rams’ plans to play a reserve game against Halifax as they did not officially register to pay in this year’s competition. A meeting will take place in Blackpool on Tuesday which will determine the next moves to try and reinstate professional rugby league in the seaside town, report League Weekly. The former supporters club of Blackpool Borough and Blackpool Gladiators has remained in place and with fundraisers, they have continued to sponsor National Conference League clubs and professional clubs over the past decade. League Weekly claim they have already informed RFL chief executive Ralph Rimmer of their plans to rejuvenate rugby league in Blackpool. New Widnes chief executive Phil Finney insists the Vikings are determined to keep their current squad together this season, before revealing they will make a presentation to Super League in the coming weeks in an appeal for the remainder of their parachute payment, report League Express. Canberra Raiders will have to pay a fee of £175,000 to Wigan Warriors if they are to secure the services of George Williams, report League Weekly. The England international has been heavily linked with a move to the NRL ahead of 2020, and The Mole reported last week that he has signed a three-year deal with the Raiders. League Weekly suggest Canberra will pay the Warriors £175,000 for promising half-back Williams.